Abstract : This paper introduces a new method for automatic robotic needle steering in deformable tissues. The main contribution relies on the use of an inverse Finite Element (FE) simulation to control an articulated robot interacting with deformable structures. In this work we consider a flexible needle, embedded in the end effector of a 6 arm Mitsubishi RV1A robot, and its insertion into a silicone phantom. Given a trajectory on the rest configuration of the silicone phantom, our method provides in real-time the displacements of the articulated robot which guarantee the permanence of the needle within the predefined path, taking into account any undergoing deformation on both the needle and the trajectory itself. A forward simulation combines i) a kinematic model of the robot, ii) FE models of the needle and phantom gel iii) an interaction model allowing the simulation of friction and puncture force. A Newton-type method is then used to provide the displacement of the robot to minimize the distance between the needle's tip and the desired trajectory. 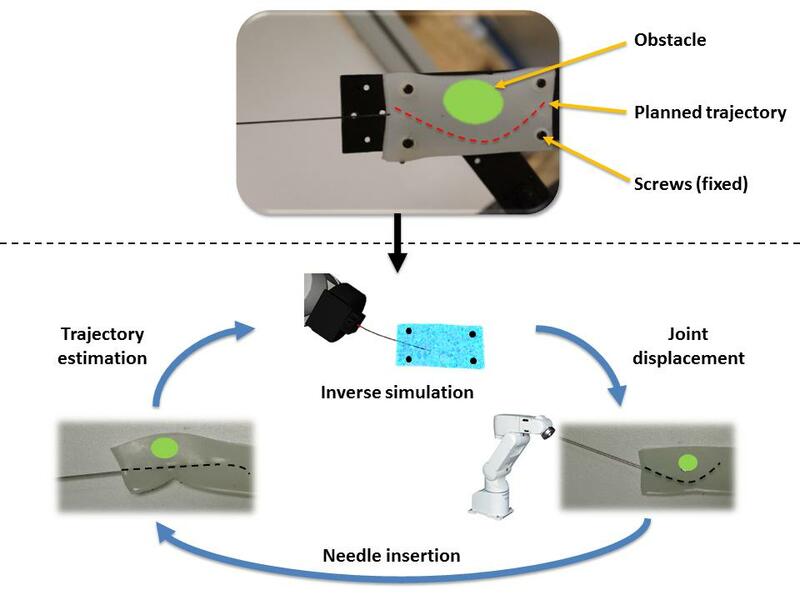 We validate our approach with a simulation in which a virtual robot can successfully perform the insertion while both the needle and the trajectory undergo significant deformations.